If it’s tough to imagine a summer BBQ without pasta salad, why not make one that’s loaded with nutrients and can handle the heat of a perfect summer day? Nix the mayo and dairy and consider tahini and roasted red peppers as a base for a nutty pasta salad dressing. I chose MagNoodles pasta because it disguises its health benefits in colorful multi whole grain penne. Carrots, spinach, tomatoes and beets are ground together with ancient grains like kamut and spelt, making this a worthwhile carb to indulge in. Worried about the texture? This pasta cooks up to a perfect al dente without any of the cardboard­-like textures associated with whole grain noodles. 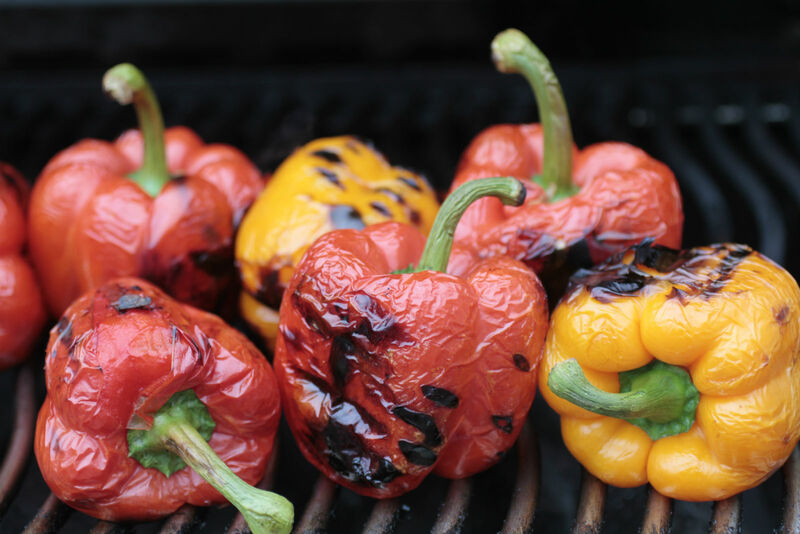 A couple of days before you fire the grill at your gathering, char a load of vibrant bell peppers on the BBQ until they’re mostly blackened and wrinkled. Plunge them into ice water and peel off the skin. Underneath, you’ll discover sweet, silken peppers that can easily be whirred into a vitamin-rich summer pasta dressing. Tahini is a perfect base for this dressing. It won’t spoil easily in the heat, and benefits from being blended a day or two in advance. Check one more thing off your list so you can relax with family and friends. Spread on whole grain toast for breakfast. Add a sliced hardboiled egg and a sprinkle of course salt. Slice leftover chicken and layer a slab of perfectly ripe tomato and garlicky tahini for the perfect sandwich. Try tahini alongside scrambled eggs and enjoy breakfast for dinner. Pack tahini with raw veggies for a perfect lunch for you or the kiddos. Or better yet, serve veggies and tahini before dinner with a chilled glass of rose. Cook pasta according to directions on package. Do not overcook. Rinse with cool water and put aside. Grill the peppers: pre­heat grill and place whole peppers on the grill, turning frequently until all sides are well-charred. Fill a large bowl with ice cubes and cold water. Remove peppers from the grill and plunge into ice water. Let them cool for 5-­10 minutes, until their skins begins to peel away from the flesh. Peel peppers and remove all charred areas. Scoop out seeds and discard. Slice or break each pepper into 4 pieces and place set aside in a bowl. Save the liquid that collects from the peppers. Make the tahini dressing: in a food processor with chopping blade, spoon tahini, lemon juice, reserved liquid from peppers, garlic, 1 tablespoon parsley, and salt and pepper to taste. Whir until smooth. Add the peppers and blend until combined with tahini. 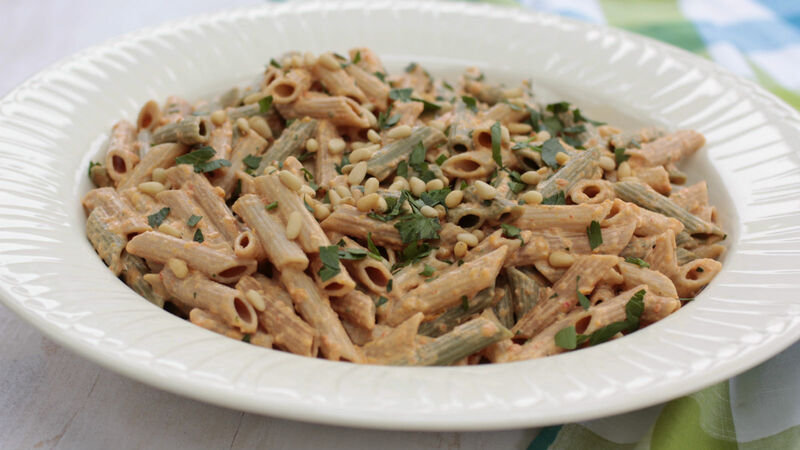 Right before serving, place pasta in a large serving bowl and toss with approximately 1⁄2 cup of tahini dressing. Coat pasta well and top with chopped parsley and pine nuts. Serve at room temperature. Notes: This dressing may be made 2 days in advance. Because tahini thickens as it rests, do NOT dress the pasta until you are ready to serve it. If dressing seems too thick, add 1 tablespoon of water or lemon juice at a time, and stir until the texture resembles a cream-based salad dressing. You’ll have plenty of tahini left over after coating your pasta. It will last 4­-5 days in the refrigerator. Lucky you!